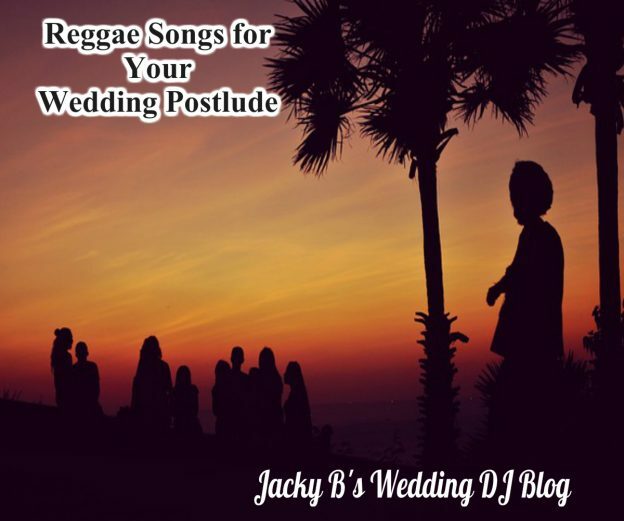 Are you searching for Reggae songs for your wedding ceremony postlude? This week’s edition of the Wedding Ceremony Music Series brings you songs from the islands to be used for your wedding postlude. The postlude is the time immediately following the wedding ceremony recessional. The amount of time needed for the wedding postlude varies for every wedding ceremony. Consider what you will be doing next as well as what you want your guests to do. Many couples choose to have their wedding receiving line at the beginning of the postlude allowing their guests to then move onto the cocktail hour setting. Other couples may choose to have their formal pictures taken as the guests enjoys the cocktail hour and have their wedding receiving line later in the reception. Other couples may choose not to have a receiving line at all. Check out the ‘To Receive, or Not To Receive’ article on my blog to learn more about wedding receiving lines. To determine how many reggae songs you will need for your wedding ceremony postlude answer the following questions. Is the wedding ceremony and wedding reception in the same venue? In this scenario, your entertainer may segue into cocktail hour music after your guests have all arrived in the area for the cocktail hour. Is your wedding ceremony and wedding reception in different venues? The postlude will last until your guests have left the ceremony area. If you choose to have a receiving line you will need enough songs to cover the time needed for everyone to go through the line. Your wedding ceremony postlude is a joyous time. The warm glow of stating to the world that you are as one. This entry was posted in Boston Area Professional Wedding DJ, Wedding Information and tagged boston area wedding dj, brides wedding tips, central mass wedding dj, Reggae Wedding Ceremony Songs, Wedding Ceremony Music, Wedding songs, Wedding Tip on September 22, 2017 by Jack Barros. 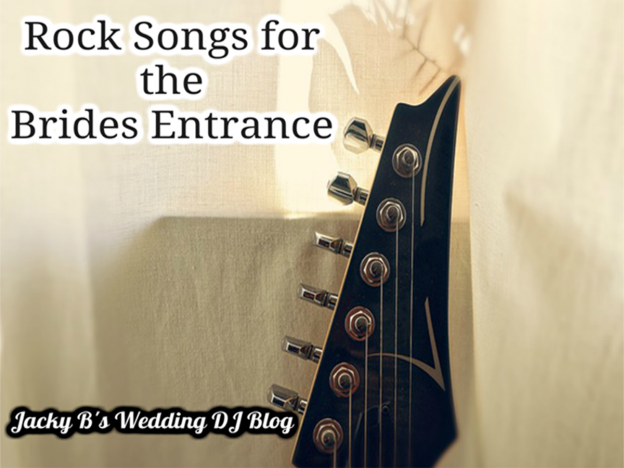 Welcome to Rock Songs for the Brides Entrance this weeks edition of our Wedding Ceremony Music Series. All aboard!ha ha ha ha ha ha ha! 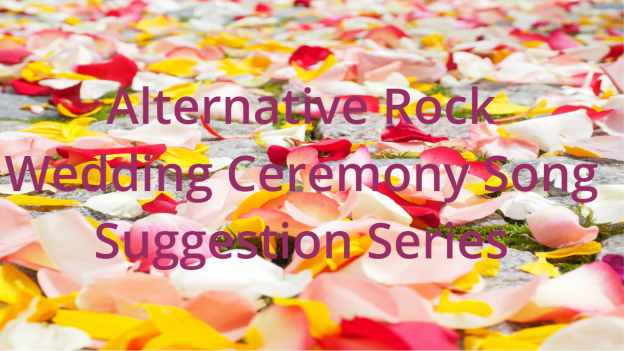 Do You Want More Wedding Ceremony Song Suggestions ? You will find great Pop wedding songs along with 10 other genres of music. You can find songs easily as the songs are listed by genre, artist and song title. The book details the different parts of the American wedding ceremony. Is there a song you would use for a Pop wedding ceremony? Love to hear it. Place any suggestions in the comments. Stop by Jacky B’s Wedding DJ Blog today! 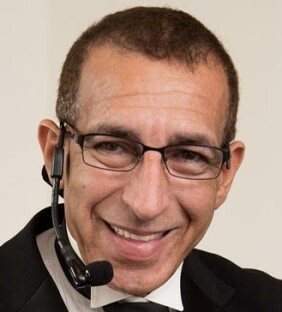 This entry was posted in Boston Area Professional Wedding DJ, Professional Wedding DJ, Wedding Ceremony, Wedding Ceremony Music, Wedding Song Lists, Wedding Songs and tagged bride tips, Jamaican wedding songs, Professional Wedding Emcee & DJ, Rock Songs for Brides Entrance, Wedding Music, Wedding songs, Wedding Tip on September 1, 2017 by Jack Barros. Welcome to Adult Contemporary Wedding Processional Songs this week’s Wedding Ceremony Music Series feature article. A weekly series where we showcase a different genre of music for the various parts of an American Wedding ceremony. Adult Contemporary wedding processional songs consists of songs that do not really fit into one category or the other. I suggest you look at other genres such as alternative genre, pop genre as well as rock, R & B and traditional genres of songs. The leading artist on this list is Celine Dion. Her songs transcend multiple genres of music. Her powerful vocals and melodies take you on an emotional journey. tells everyone in your processional how much they mean to you. Somewhere Over the Rainbow the rendition by Joe Satriani is an electric guitar instrumental you may want to consider using for your adult contemporary wedding processional song. Remember when choosing songs for your wedding processional, you have options with songs that on the whole may not be appropriate, but may have a lyrical section that is long enough for you to use. Factors to consider are how many are in the wedding processional and how far they will have to walk. 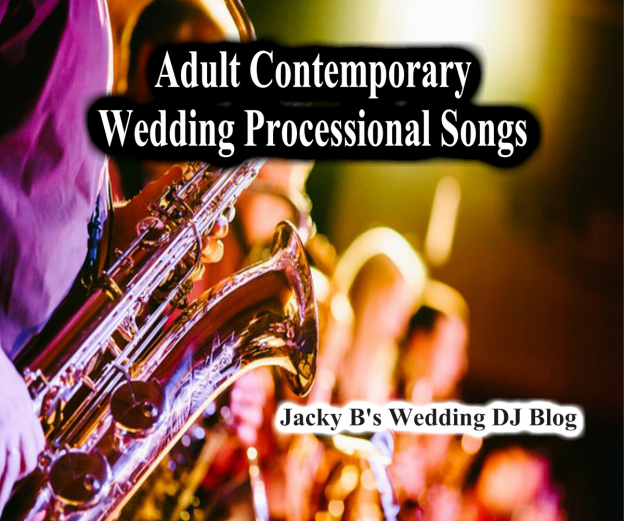 Want more Adult Contemporary Wedding Processional Songs? You will find great country wedding ceremony songs for the prelude along with 10 other genres of music. You can find songs easily as the songs are listed by genre, artist and song title. The book details the different parts of the American wedding ceremony. Is there a song you would use for a Country wedding ceremony? Love to hear it. Place any suggestions in the comments. Do You Want the Perfect Wedding Ceremony? You Can Have the Perfect Wedding Reception! This entry was posted in Boston Area Professional Wedding DJ, Wedding Ceremony Music, Wedding Songs, Wedding Tips and tagged boston wedding dj, brides wedding tips, central mass wedding dj, new england wedding dj, Wedding Ceremony Music, wedding dj tips on August 30, 2017 by Jack Barros. 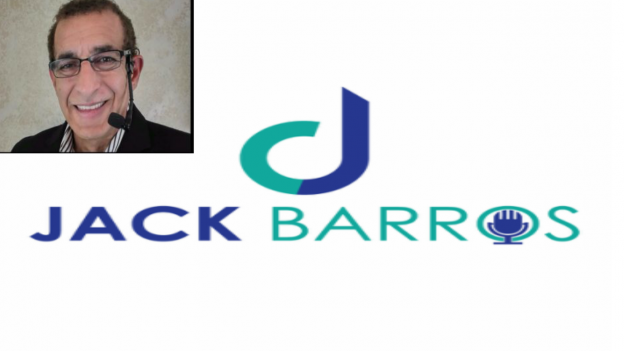 Welcome to Jacky B’s Wedding DJ blog! Here you can find great information and ask all of your questions about wedding ceremonies and wedding receptions. The rest of my website tells all about me, I already know about me. I need to know about YOU! The more you share with me the better I can perform for you. This page and site is all about my brides and what you need and want. Visitors and clients alike let me know what YOU want from a Wedding DJ website. Leave a comment below or on facebook if you’d like. and Jacky B’s Wedding DJ Blog. Here’s what to expect to see on this blog. I’m going to work on a contest right now. Tip of the day: For your wedding related contest entries get yourself a Google phone number and email address. You can set up the phone number so that when they leave a message you can read it in an email. Then once you’ve hired your vendors you can give them your current info. I hope you find this site helpful. Check back often. A primary post thread is The Wedding Ceremony Music Series. 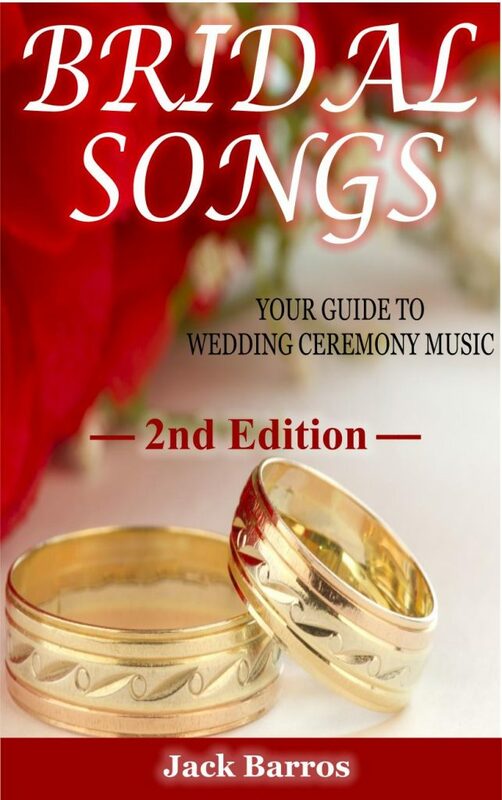 Here you will find song suggestions for every part of your wedding ceremony. Following is an easy index of articles. This entry was posted in Boston Area Professional Wedding DJ, Wedding Tips and tagged boston area wedding dj, boston wedding dj, boston wedding emcee, bride, bride tips, Brides, brides wedding tips, central mass wedding dj, groom, grooms, new england wedding dj, Professional Wedding Emcee & DJ, wedding, wedding contest, wedding DJ, wedding dj tips, wedding info, wedding information, Wedding Tip, weddings, worcester wedding dj on October 12, 2015 by Jack Barros. The most popular Alternative wedding ceremony song is “Bittersweet Symphony” by the Verve. The instrumental version is the one most brides choose. This entry was posted in Boston Area Professional Wedding DJ, Boston Area Wedding DJ Information, Professional Wedding DJ, Wedding Ceremony, Wedding Ceremony Music, Wedding Information, Wedding Prelude, Wedding Recessional, Wedding Song Lists, Wedding Songs, Wedding Tips, Wedding Unity Ceremony and tagged boston area wedding dj, boston wedding dj, professional wedding dj, wedding ceremony, Wedding Ceremony Music, wedding ceremony order, wedding disc jockey, wedding prelude, Wedding Prelude music, wedding processional, wedding recessional, Wedding songs, wedding unity ceremony, what happens in a wedding ceremony on October 12, 2015 by Jack Barros.